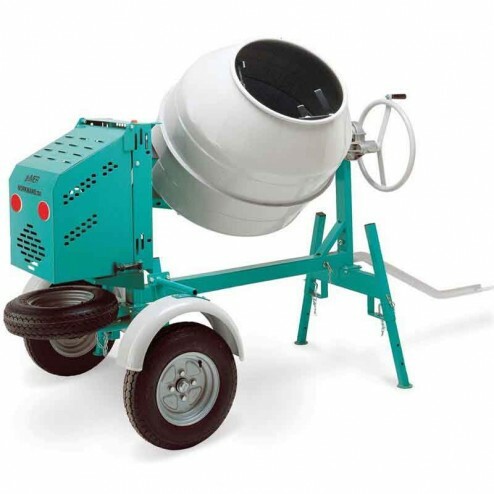 The Imer Workman II Series Steel Drum Series Concrete Mixer is perfect for a multitude of applications where these multi-mixers can be used. Mix stucco grout mortar and of course concrete. Many sizes and power options are available to handle just about any mixing need that you may have. In 2002 the Workman mixers received a major overhaul which revolutionized the way that mixers will be made in the future. Our competition still does not know how to handle this threat. People that have used the Workman II know a good mixer when they see one and have a hard time being convinced otherwise. The Workman II's in all models share the same technology like; self-locking geared dump wheel 360 degree continuous rotation of the drum serpentine belt drive to a fully oil-enclosed gearbox. No exposed gears to grease or pinch points for safety reasons. Spare tire adjustable stabilizers torsion bar suspension ball hitch adapters fenders and powder coat finish come standard on all units. The new technology coupled with efficient gearboxes and power trains allow for less energy to be used and consumed making us an eco-friendly company. Most of our combustion engine options operate flawlessly even at half throttle. Easily replaceable, one piece removable drum. Great for efficient mixing of most styles of cement, stucco, mortar and grout. Drum features a self-locking geared wheel with 360 degrees rotation. .
Includes a spare tire, ball hitch, and standard fenders. Equipped with 20" pneumatic wheels.